What exactly is Chelsea’s concept of Christian? Can the daughter of a woman who attends “spirit cooking” events, and who is friendly with the “Church of Satan” in NYC have any valid idea of what a Christian actually is? This entry was posted in abortion, Evil, Hillary Clinton, Planned Parenthood and tagged abortion rights, Chelsea Clinton, virtue signaling. Bookmark the permalink. I wonder if Rabbit Tooth Chelsea knows she almost didn’t make it here! Her mothe KILLARY Rotten Clinton didn’t want children, Slick Willie made her happen. And if she thinks she’s going to get rolled into politics by momma, wake up! Clinton’s a are a thing of the past. Go home and have more babies, may God help you. Like her mom, Chelsea has no conscience. So, it’s “Christian” to kill the unborn. Chelsea Clinton has taken Orwellian Newspeak to depths even George Orwell would not have anticipated. 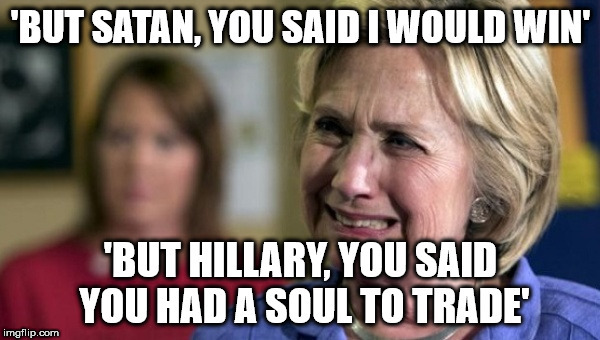 Her father isn’t Webster Hubbell; her father is Satan. I don’t know where this idiot got her bastardized version of Christianity, but I can think of few things that will get pro-life people like me to the polls in November. I hope the dems really are stoopid enough to run Web Hubbell’s spawn for a nationally visible political office – and I hope komrade Broom Hilda campaigns for her, too. Watching this twit of a trophy kid get creamed would be seriously BIG FUN. To be a Christian, do the exact oppose of what a Clinton espouses. More gaslighting by the Clintons. Will they ever go away? The only thing I can say is that when these people depart their earthly bodies, they will suddenly discover they were wrong. Maybe the dems (dims) could run chelsea hubbell for president, and funny uncle joe biden for v.p. Sounds like a match made in liberal heaven. 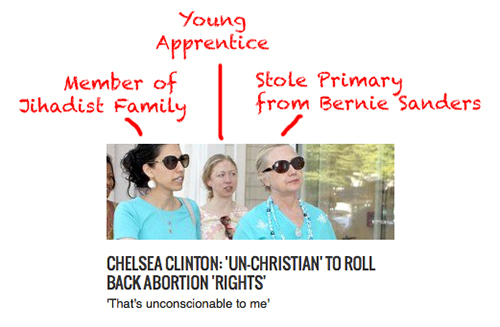 Is Chelsea under a trance, or is she merely parroting the new pseudo-Christian nonsense? Let’s look at it: How many churches today have been infiltrated by leftist and Marxist elements? Add to that the number of so-called Christians who are ready to LEAP at Romans 13 in an effort to keep real Christians on the “reservation”—as if Christianity were a suicide pact! Well, we finally found someone DUMBER than Nancy Pelosi! Chelsea can stop talking. Now. She has absolutely nothing to add that I’m the least bit interested in hearing. This is the one Hillary let live. According to Sally Perdue Miller, Hillary’s had numerous abortions herself. @Flanders, The largest insurance company in the world, AIG – American International Group was bought by our unlawful corporate government under the Bushwhacker’s Administration then concealed from the public by Congress and the media. The taxpayers were stuck paying off AIG’s claims just as they were stuck during FDR’s 1933 bankruptcy which settled in 1999. Clinton never returned 3 generations stolen property and now we have Obummer’s 2015 bankruptcy. Thanks to dedicated researchers all of these crimes have been exposed and claims filed with the Trustees on behalf of all Americans. @Debra L Williams – After reading your post, I thought of this picture. Next she will be stating that banning sacrifices to Moloch is ‘UnChristian’. The skank wearing the inverted cross is now an authority on Christianity. Trying to be logical with the Left is like trying to teach an pig to sing; it wastes your time and annoys the pig. All they know are shouting matches and crybullying. Chelsea is a unattractive rich kid trying to be important. A prime example of the elite and effete Left, which is being increasing reviled by those that have no desire to serve their pernicious needs and desires.